When you need a new dental crown or restoration the same day in Salt Lake City, Dr. Brickey and Dr. Provine at Natural Smiles Dentistry make the process quicker, easier, and more affordable than ever before. CEREC® stands for CERamic REConstruction – it is a piece of advanced technology that allows us to restore your smile in just one appointment. CEREC® uses the most advanced dental technology, including 3D imaging and CAD/CAM technology to create the restoration. In layman’s terms, it is a computer-designed restoration for your tooth that we design, create and place all in a single visit. The whole procedure takes between 1-3 hours. No more messy impressions, clunky temporaries, and return visits. CEREC® offers the ultimate convenience of same day dentistry so you can get back to the things that matter most! In cases where the decay is relatively small or the damage to the tooth is less than one third the size of the affected tooth, composite or resin filling material is often the most cost effective and aesthetic solution. Natural Smiles Dentistry does not place silver (mercury) fillings as we feel that we can almost always restore a tooth with a non-metallic or mercury-free, tooth-colored material. Inlays/onlays are the interim step between a filling and a crown. Inlays/onlays replace the portion of a tooth while leaving as much of the natural tooth structure intact as possible. This restores the strength to the tooth without the need for a crown. Crowns are one of the most common dental restorations, and can be used to repair a broken or decayed tooth, or replace a missing tooth with the help of a dental implant. Crowns are tooth shaped caps that fit over any remaining healthy tooth structure to fill the gap and give you back a complete, fully functioning smile. Bridges are the next step after a crown. If you’re missing a tooth but are not a candidate for dental implants, we can replace your tooth with a bridge. Your bridge may be anchored with clasps, or may be connected to crowns on both sides to permanently secure it. 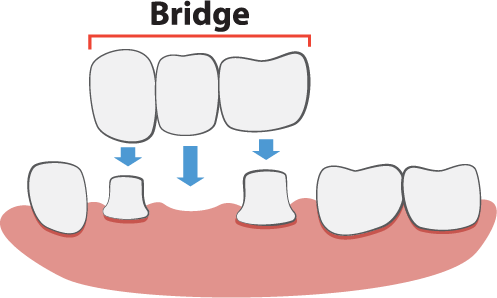 Bridges are also useful if you are missing multiple teeth in a row, or have damaged teeth on either side of the gap. If you’re missing most or all of your natural teeth, or living with dentures that rock and slip, and are looking for the most life-like way to restore your smile in the least amount of time, we would love to speak with you about our implant denture options for a new smile in just one day! We use the minimum number of dental implants, usually four, to support the maximum number of teeth, a full arch. 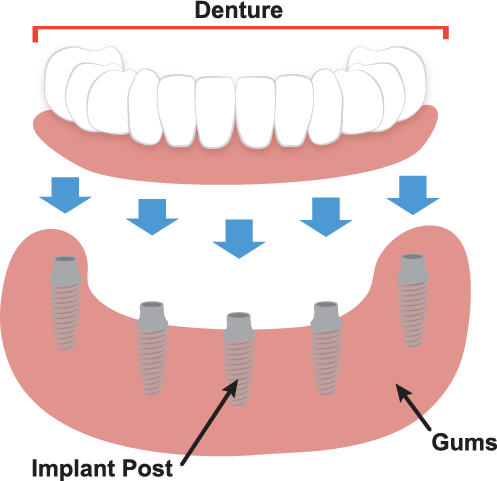 The angle at which the implants are placed allows them to support the maximum number of teeth, and allows the implants and the dentures to stabilize each other during the healing process. There is no six month healing time like regular implants, and no time you have to live with no teeth. Get in, get out and get back to your life with a brand new smile in just one day! If you’re suffering from broken or missing teeth and would like to learn more about our restorative options, we would love to speak with you. Contact your Salt Lake City dentists, Dr. Brickey and Dr. Provine at Natural Smiles Dentistry today by calling (801) 997-6655 or schedule an appointment online.